The new Champions Courts at the entry offer walkup match access. For renderings of the new expansion and the new facade of Paul Flory Player Center, click here. For the latest construction photos please visit the photo gallery. 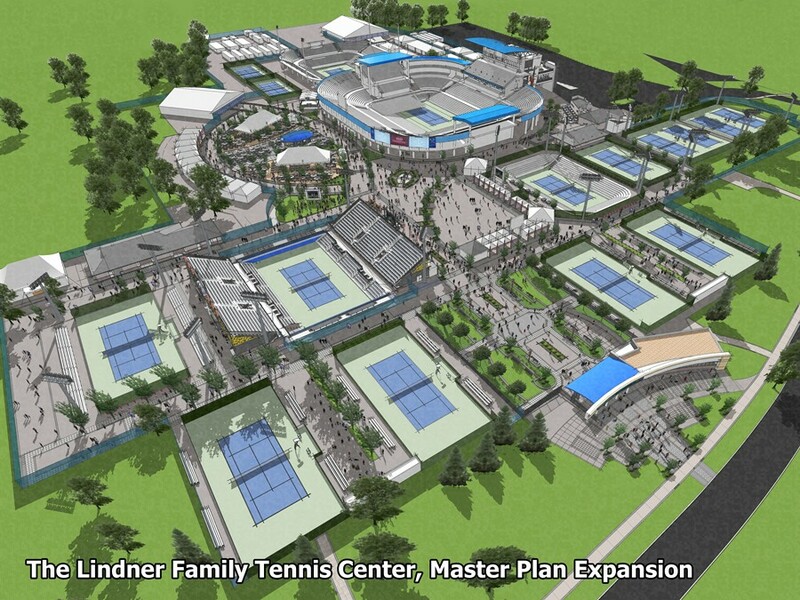 The Lindner Family Tennis Center in Mason, Ohio will be expanded by 5.4 acres to include six new courts, and a new ticket office and entry plaza, officials of Tennis for Charity and the United States Tennis Association (USTA) announced today. 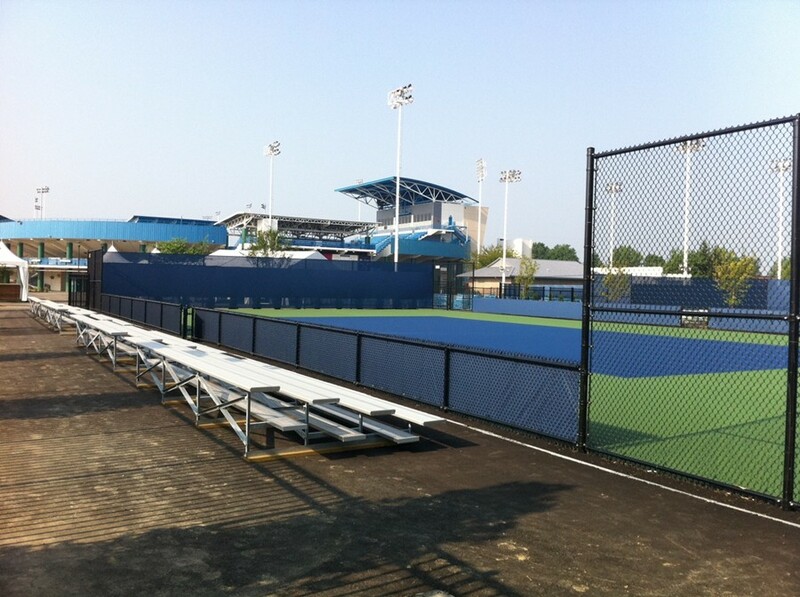 The Tennis Center is the host of the annual Western & Southern Masters and Women’s Open, the largest professional summer tennis tournament in the nation outside of the US Open. The grounds are located approximately 20 miles north of Cincinnati. Crews will break ground immediately following the men’s finals, to be held August 22, 2010. The new footprint of the Tennis Center will span 19.0 acres, up from 13.6 acres in 2010. The expansion will stretch to the North and East of the current grounds. "With the tournament planning to host the men and women simultaneously in 2011, this expansion is necessary to accommodate the increase in tennis and attendance expected at the combined event," said Ken Berry, president of Tennis for Charity. Tennis for Charity owns the land and leases the facility to the tournament. The expansion plans will be designed by Browning, Day, Mullins & Dierdorf in Indianapolis, and the construction will be completed by Vector Construction of Northern Kentucky. Both organizations have been involved with the Lindner Family Tennis Center for more than 20 years. "The goal of the Master Plan is to create a festive urban tennis garden that generates excitement and action throughout the grounds," said executive vice president, Greg Jacoby. This year’s tournament marked the opening of the newly constructed player and media facility built into the West side of the 11,400 capacity Center Court. Also today it was announced, the 52,000-square-foot structure will officially be named the "Paul Flory Player Center," in honor of the tournament chairman, Paul Flory. Flory joined the event in 1975 as tournament director and guided the event from a small tournament held at Coney Island to one of the largest in the world. "Paul truly is a ‘players’ tournament director, and it is only fitting this world-class facility now bears his name," said USTA President and Chairman of the Board, Lucy Garvin. "This building will forever honor the man who laid the foundation for this tournament’s great success."